← A hike, a sunrise, things that creep, and a glorious morning! It’s time to go to town! The crew and I have been park-bound since we arrived about six days ago. After our morning walk and some housekeeping, I attempt to unhitch the PTV for the first time. We need groceries. Everything goes along fine without a hitch, well, with a hitch, but smoothly. I unhook the chains and break-away cable, take off the hitchlock, pull the lever up, and start to crank the jack handle to lower the jack down onto the plastic cone. I’m looking at a whole lot of pounds of trailer here. I see a whole lot of pounds of trailer hopping over the chocks to flatten me on the pavement before careening down the slope to crash into that concrete picnic table over there. Okay. How often do you hear that happening? Don’t be silly. Keep crankin,’ woman. This crank is getting hard to turn. I watch that jack jamming down into the plastic cone. I call Reine. (She and Paul gave me the cone.) “Hey, Reine. I’m trying to unhitch and I’m wondering. Is this cone going to hold?” She reassures me and, like a Lamaze coach in the delivery room, she encourages me to push really hard on the dang crank. Suddenly Reine’s gone! Lost signal! Oh, well. There’s no stopping me now! This baby’s comin’ out! I give one more big turn to the crank and pow! . . . off comes the hitch from the ball. I did it! My first unhitching! Next I drive the PTV over to the empty, reserved site across from mine. It’s level and shady, and I want to check the oil. Hmmm, no oil needed. Huh? Is it normal to drive from Georgia to northern Mississippi to Texas (south of Dallas) to north-central New Mexico and not burn any oil? I check it again. Okay. Don’t argue with a dipstick. That’s my motto. The crew boards the PTV and we drive toward the town of Santa Rosa. A yellow flower leans over and plants a kiss on the PTV! It’s about 6 miles, I guess, . . . one incredible vista after another. The best views I dare not stop to photograph due to the steep and winding road. A mile or so and the terrain flattens. Happy flowers line the road as if it were springtime. A bit shy, are we? As always, the New Mexico sky steals the show (unretouched photo). And always, over 180 degrees of incredible desert scenery, including the lake with it’s rocky cliffs, remind me we really are in New Mexico. We stop at an overlook to see the dam. In the photo below you can see where the road crosses over. It’s on top of all those rocks on the left. Earlier I talk with Josh, the park guy cleaning out the grills at each campsite, which shouldn’t need to be done because a fire ban has been in effect, including charcoal grilling, for quite some time now. Although last weekend I did see a Neanderthal building a two-foot high fire in his grill. I ask young Josh if he’s lived around here long. I laugh to myself thinking about what I’ve gone through to get here. Some more campers move into the Santa Rosa State Park. A couple from south Florida on their way to Angel Fire pull a small Airstream with a Land Rover. They are interested in the crew as they once had a similar canine pair. Another couple, he from the mid-West and she from Arizona, tour in a humongous Class A Dutch Star with slide and a Jeep Laredo toad. I remark that my Casita would probably fit in their bedroom. Bridget and Spike enjoy meeting their two dogs. Both couples leave after only one night. You know? I’m loving this life. The Casita is level, side-to-side. It's the photographer who needs a few levelers under her right foot. I thank God for this day. I accomplish my first unhitch. The PTV runs great. Our fridge and cupboard are stocked with good food. The air conditioner keeps us cool. Bridget, Spike, and I are healthy. Everywhere I look there’s something interesting to see. And I don’t have to go to work! This entry was posted in Simple living and tagged campground, camping, casita, fulltiming, New Mexico, Santa Rosa, Tow vehicle, Travel. Bookmark the permalink. I’m so envious but grateful that I can live vicariously through your blog til I get out there myself. Thanks Sue & K9 Crew! That’s what motivates me to write. I remember when I had to live vicariously through other people’s blogs. That cone used to be RED and the faded color was achieved while holding our Casita safely so you’re fine. Sorry bout the intermittent connection you had yesterday. As I said on the phone, Jonathan at Casita isn’t thinking to tell a fulltimer that she doesn’t need an electric tongue jack. The jack may not be that hard to turn but holding a switch up or down is WAY easier and well worth the 200 bucks in my mind. Anyone reading Sue’s blog that’s thinking of fulltiming, get the electric tongue jack. You’re gonna be raising and lowering the tongue a lot more often than those of us that camp less and it comes with an emergency crank “just in case”. I’ll be okay cranking the jack for now. Someday I may have to get the electric tongue jack . . . when I’m an old lady! Checking oil is wise. My truck has only 177,960 miles on it and still does not use oil between changes. Batteries in this hot weather need water more often than tow vehicles need oil. I have noticed that groceries are a lot more expensive in NM than down in Rockport, TX. Jim Melvin is headed into the area you are in. http://jimbosjourneys.com/ and Steve Cox is over near Taos right now http://stevecox2go.blogspot.com/ . Say HI if you see them. They are nice folks. I noticed the grocery prices were high. I figured it was because that market is the only one in Santa Rosa. So it’s all over NM, huh? When I had three dogs (Janie and the crew), I used to buy a big bag of dog food for $18.50 in Georgia. I noticed the little market in Santa Rosa sells it for $25. A box of Cheerios is $4.79. Passed that up. I found some weird-brand raisin bran for $2.79 and it’s pretty good. I feel sorry for the locals. Thanks for the links. Will do. Oh Sue & Crew, you give hope to those of us who will follow in your rutted tracks! So pleased to learn that your first unhitch came off so well. Can’t wait to hear how flawlessly the first hitch-up goes. Were Spike and Bridget happy to get home after the trip to town? Or are they just happy, period? Especially that the pack is intact at all times now? I’m going to ask the guy who helped me back-in (when I was trying to have a heat stroke) to supervise or check my hitched-up combo. If he’s not around I’ll ask someone who hauled a trailer into the park. I don’t think it’s a good idea to get over-confident when safety is the issue. Spike always loves an adventure. He hopped into the passenger seat and watched the scenery go by. I had to scold Bridget several times to stop whining. She doesn’t do change very well. She’s going to have to learn, because there’s a lot of change in her future! How can I live like this and not be grateful? It’s so nice not to be pressured by a job or a schedule. My “mellowness” must be coming through in my writing. You made my day!! So glad to hear you are so happy. Give Spike and Bridget a hug for me. I was hugging Bridget when your comment popped up! The plastic cones do suffer from UV degradation and get brittle. Since this one is fading it probably is in the last half of its life. I prefer a metal stand myself, but your rig is so extremely light you can live with the plastic ones easily. Your description of the unhitching and difficulty with jacking where the coupler apparently suddenly sprang loose indicates that the van ball was tensioned against the coupler front lip. Let the van back a fraction of an inch next time. Then the coupler will rise easily, steadily and smoothly. If it is not rising smoothly then something is jammed. Usually the tow vehicle needs to release tension on the coupler either forward or reverse. 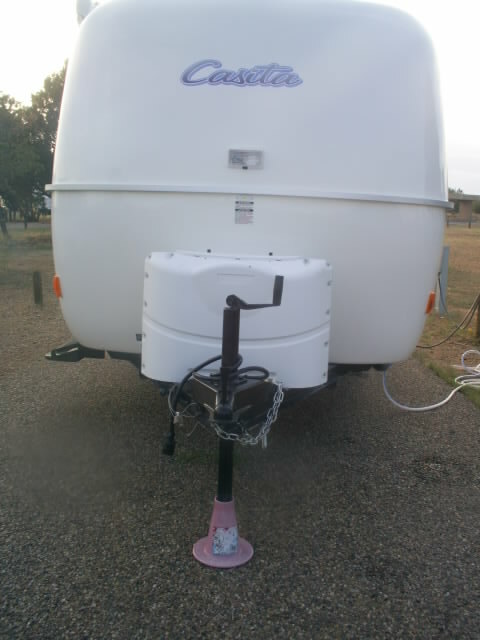 Your trailer is so light on the coupler it should never be difficult to raise the coupler. For instance my 700 + pound tongue weight requires minimal effort to jack up the Castle. I can usually spin it with two fingers. Have fun. Another factor may have contributed to the tension. The Casita is sitting on the level part of the site. The PTV was sitting on a slope. That couldn’t have helped. Also I’m wondering if some lubrication might be helpful, although I realize that’s minor. I use white grease on my hitch, I have seen the wear on a hitch ball from not greasing. The link works. Thanks, Bill. I do want to get some of that. The Casita Owners Manual says to grease the hitch ball. The slope will not be a factor until the coupler edge is hitting some part of the draw bar. 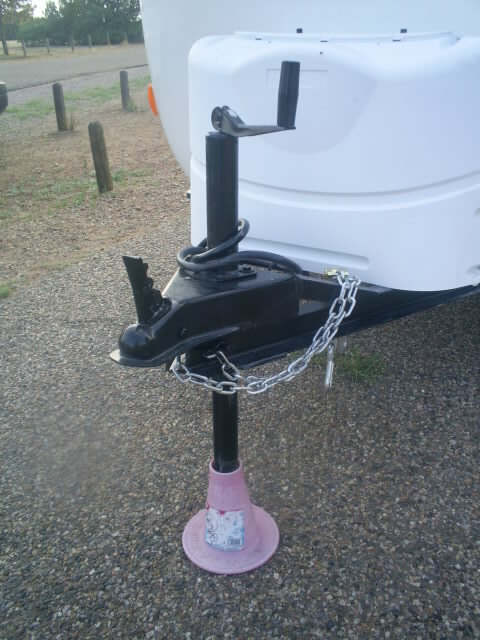 Your hitch is not as sensitive to differential slope as a fifth wheel hitch can be. I didn’t like having the PTV pointed down like that with the Casita on level ground. It made the hitch area like a fulcrum, for lack of a better word. I couldn’t be fussy at the time. It’s good to know it’s not a problem when that’s the situation. I’ll remember next time I unhitch to adjust the PTV ever so slightly. I’d like to see that solve the hard cranking. Of course, what I call “hard cranking” may be easy spinning to someone else. I’ve got to get these arms in shape! Sue, don’t you make Old Fat Man mad, he’s jewel you can’t let go of. It’s nice to have traveling friends who can help out. Old Fat Man knows I respect his advice. I learned long ago not to ignore the voice of experience spoken through knowledge and common sense. OFM has a point. It shouldn’t be any more difficult to raise the Casita off the hitch than it is to crank it up and down when it’s NOT hitched. Experiment with cranking when it’s not hitched and you’ll get the feel for it. Excellent suggestion, Reine! I’ll do that. Then I’ll have a baseline from which to judge whether I have the tension off, as OFM pointed out. Oh, Carol! You really made me Laugh Out Loud!!! Now I have another reason to keep up with my blog. I’ve got to help Carol get her sleep and have sweet dreams . . .
Lots of good advise from OFM and Reine. I never saw that stand before that’s pretty neat. Of course I didn’t keep my chalet all that long. I have been reading so many blogs lately by solo women, I am, itching to get home and jump in my motor home and take off. But its still way to hot to head back to Tucson so I will just stay put until Oct. 15. This place is starting to empty out so I will be loving it. I will get my solitude. Not that anybody really bothers you here. And I take off for places to take pictures and breath deeply. Thanks, JoJo. I will. And you enjoy your stay, too. Get ready to be really excited. Weather.com says that after a high today of 92……. the …HIGH… for Santa Rosa tomorrow will be…(drumroll)……. 77 degrees….. with a low of 54. Cooler weather is ON THE WAY!!! In your picture your Casita looks a bit nose high. Once you unhitch, be sure to check the front to back level and lower (or raise) the tongue as needed. You’ve probably already done this but figured I’d mention it for the folks that are getting ideas from your blog. Yeah, I didn’t think of it until I drove the PTV over to the other site to check the oil. I looked back and immediately remembered! It’s good you brought it up, not just for me. There’s no way for me to calculate all I’ve learned reading comments on blogs over the past 7 years or so. 77 degrees? I can already feel a change. The cool mornings are lasting longer. Hi Sue. Saw a link to your site in my site stats so thought I would pay you a visit. I am enjoying reading about how you became a fulltime RV’er. 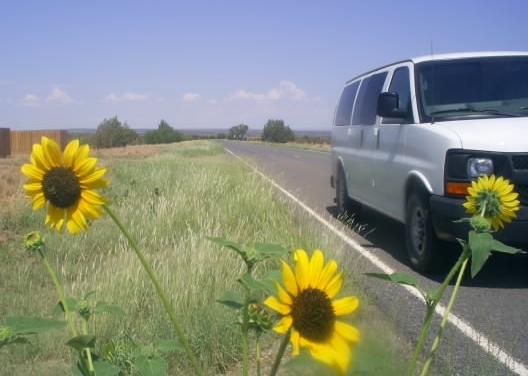 I have been on the road since July, 2010 and have spent a great deal of time in New Mexico. I see that you got the Annual Pass. What a great deal! Right now I am stuck in Dallas waiting for repairs on my rig. Then I will be headed over to New Mexico. I hope to run into you one of these days. I have met many wonderful people on the road especially in New Mexico State Parks. That is also where I met Barney of http://ofmadventures.blogspot.com/. Hi! You’re jimbo, right? I was reading your blog yesterday after OFM mentioned you were headed this way. I read about your delay. It’s great that you have family nearby to put you up while you wait out the repair. If you see my Casita with a white Chevy Express van, be sure to stop by!